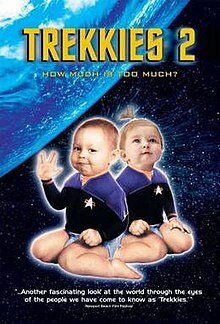 Trekkies 2 is the 2004 sequel to the 1997 documentary film Trekkies. The documentary film travels throughout the world, mainly Europe, to show fans of Star Trek commonly known as Trekkies. It also profiles people from the first film, including Barbara Adams and Gabriel Köerner. Also featured are Star Trek-themed punk bands from Sacramento, California, including the "No Kill I" franchise. This includes "No Kill I", "No Kill I: The Next Generation" and "No Kill I: Deep Space Nine". ^ "The No Kill I - Sacramento Star Trek Punk Rock Band". April 17, 2007. Retrieved October 23, 2014.